Under the authority granted by the Uniform Parish Regulation (UPR), these parish bylaws are set forth to meet the specific needs of this Parish. The Parish shall be known as "Holy Resurrection Greek Orthodox Church of Brookville, New York." The membership of the Parish will consist of all Orthodox Christians in good ecclesiastical standing, eighteen (18) years of age or older, who have made a Fair Share commitment. A. Individual: A person, eighteen (18) years of age or older, in good ecclesiastical standing (including a legally and ecclesiastically divorced person or widow/widower). B. Family: A husband and wife, living together, one of whom is Orthodox and in good ecclesiastical standing. A. Individual Membership: shall entitle the individual, who is at least 18 years old and an Orthodox Christian, to all available Parish privileges, including to be listed on the Parish rolls, included in mailing lists, and to one (1) vote at any regular or special meeting of the Parish Assembly and elections for the Parish Council See Article II, Section 5 and Article III, Section 4 for members entitled to vote. B. 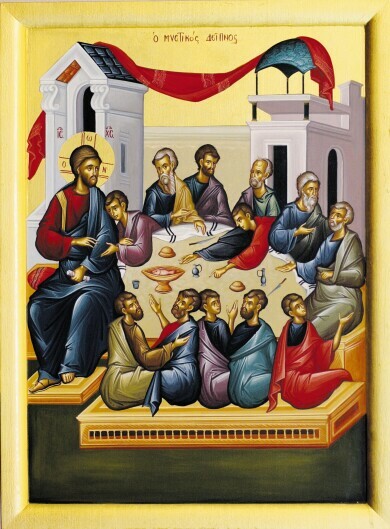 Family Memberships: shall entitle the family (husband and wife) to be listed on the Parish rolls, included in mailing lists and to one (1) vote for (and to be exercised by) each Orthodox spouse at any regular or special meetings of the Parish Assembly and elections for the parish council. In the event that the non-Orthodox spouse converts to the Orthodox faith after the family has already been on the Parish rolls, they shall be deemed a member of the parish with the same date of enrollment as their spouse immediately upon their chrismation into the Orthodox Church. C. Children: Less than eighteen (18) years need not participate in Fair Share. Orthodox Christian children will be considered members with full benefits under their parent’s membership. They are not permitted to vote. A member in good standing of another Parish of the Greek Orthodox Archdiocese may transfer to this Parish as a regular member, without additional financial obligations for the remainder of the calendar year upon presentation of a certificate of Transfer signed by the Priest of the former Parish. The transferred member may receive the privileges of the Parish immediately, and may participate at Parish Assemblies and vote in Parish elections three months after having enrolled as a Parish member. When a parishioner desires to transfer from this Parish to another, the parishioner shall notify the Parish office of this intent, and shall obtain a Certificate of Transfer signed by the Priest. The members of the Parish shall convene at least twice each calendar year at dates announced by the Parish Council (one meeting in the fall, and one meeting in the spring). Special Parish Assembly meetings of the members may be called by the Priest, the Parish Council or by written petition signed by members in good standing of the parish who collectively represent at least ten percent (10%) of the Parish membership. Petitions for convening a special Parish Assembly must be submitted to the Priest and the Parish Council stating the purpose for the meeting which purpose shall not involve canonical or dogmatic issues. All general or special meetings of the Parish Assembly shall require the presence of thirty-five (35) members in good standing as a Quorum to convene such meetings and transact business. If a quorum is not present, the Parish Assembly shall be called a second time within twenty-one (21) days. At such time, decisions may be taken by the number of parishioners in good standing present, with the exception of matters pertaining to the purchase, sale or encumbering of Parish property, in which case a quorum of parishioners in good sanding shall be required. Notice of a Parish Assembly shall be sent by first class mail to each member not less than ten (10) nor more than twenty-five (25) days before the meeting and shall be directed to each member at their address as it appears in the records of the Parish. All notices must include the agenda for the meeting, which shall state the purpose(s) for the meeting. A. New Members: may vote at Parish Assemblies if they have been members in good standing (pledged Fair Share) of the Parish for at least three (3) months. a. For Parish Assembly meetings in the first six month of the calendar year, a person whose name appears on the membership role as being in good standing, (has participated in Fair Share the preceding calendar year) is entitled to participate and vote. b. For Parish Assembly meetings is the second half of the calendar year, only members in good standing (pledged Fair Share) for the calendar year are entitled to vote and participate. A. The Parish may purchase real property, or sell, mortgage or otherwise encumber its real property, or construct a church edifice or other buildings upon approval of two-thirds (2/3) of the parishioners in good standing present and voting at a Parish Assembly duly called for that purpose, (provided that approval from the Archdiocese is received following that decision). The Agenda for that meeting must be mailed to the members at least fifteen (15) days prior to the Parish Assembly. B. All other decisions shall be by a simple majority vote of the Parishioners in good standing present and voting at the Parish Assembly. C. Proxies and absentee ballots are not permitted at Parish Assemblies. All loans or commitments to borrow money negotiated on behalf of the Parish, by any authorized officer, Parish Council member or any Committee Chairman elected or appointed, shall require the prior approval, authorization or ratification of the Parish Council if they exceed one thousand ($1,000) dollars with the exception of Fund Raising Affairs sanctioned by the Council. All loans and encumbrances require Parish Assembly approval as well as Archdiocese approval, as per Article II, Section 6(A). The Agenda for Parish Assembly meetings will be set in accordance with the Uniform Parish Regulations. A. As of January 1, 2015, the Parish Council shall be reduced to and shall thereafter consist of fifteen (15) members, who shall be members in good standing of the parish. B. Elections shall be held annually and terms staggered so that five (5) members are elected one year, five (5) members the subsequent year and five (5) members the third year. Nominations for the Parish Council shall by held at the fall Parish Assembly meeting. A nominee for the Parish Council must be at least twenty-one (21) years of age and a Fair Share member of the Parish in continuous good standing for at least twelve (12) months prior to being nominated and must comply in his or her life and activities with the faith and canons of the Greek Orthodox Church. A. Location: The election shall take place on Parish premises in a specific location, which will be announced in the Notice of Election to the Parishioners. B. Date: Elections shall be held on a Sunday, no earlier than the first Sunday in November and no later than the second Sunday in December to conform to the Uniform Parish Regulations. C. Voting Procedure: Voting shall be conducted by secret ballot. Absentee ballots are permitted but must be in the hands of the Election Committee before the start of voting. D. Ballot: Ballot must contain votes equal to the total designated number of council members to be elected or it shall be deemed invalid. E. Members entitled to vote: Parish Council shall certify for the election committee the Parish Membership Roll prior to the elections. See Article II, Section 5 for definitions of members entitled to vote. Any member of the Parish Council who shall absent themselves from three (3) consecutive meetings of the Parish Council, unless they present at the next regular (4th) meeting of the Parish Council a satisfactory excuse for their absence, shall be subject to removal from their position on the Council by the Parish Council members. A majority vote of the Council will be required. A Parish Council member may be suspended or expelled for any violation of the Bylaws or conduct adjudged improper or prejudicial to the best interests of the Parish, by a two-thirds (2/3rd) vote of the Parish Council. A. Location of Meeting: Any meeting of the Parish Council, whether a regular or a special meeting, shall be convened and held at the office facility of the Church, unless for health or safety reasons, the facility cannot be used. (1) That a scheduled Parish Council meeting is actually being convened and held at the church’s facility. (2) That the Presiding officer (President or Vice President), Secretary (or Assistant Secretary or person recording the minutes of the meeting) and the Priest, all must be physically present at the church facility for the meeting. These persons shall not be eligible to participate through teleconferencing at any meeting in which they are functioning in such capacity. (3) That the equipment used for teleconferencing must allow for all participating Parish Council members, whether assembled at the meeting place or participating via teleconferencing, to hear everyone else and to be heard by everyone else. Teleconferencing shall be restricted to voice or voice/picture only communication. No texting or emailing shall be allowed. (4) That a “bridge number” shall be established along with an access password, at least four (4) days before any meeting and communicated to each Parish Council member via email to the email address established by that member for communication with them. Any Parish Council member, intending to participate in a meeting via teleconferencing; (a) must make that intent known to the Parish Council Secretary, no later than Three (3) hours prior to the scheduled time of the meeting; and (b) disclose where their physical location will be during their teleconferencing, and (c) state the reason they are unable to attend the meeting in person. Any documentation generated in connection with the creation of a bridge number shall be preserved as part of the records of the church. (5) That the Secretary of the meeting shall establish to their satisfaction, the presence of any teleconferencing member at the beginning and at the end of all meetings, and may request confirmation of their continuing presence at any time during the meeting. The teleconferencing member must verbally certify at the beginning of the meeting: a) that the member is alone, or that the member is in a position where no one else is able to hear/see the communications of the meeting; and b) that no recording of the communications of the meeting is being made by the member or allowed to be made by others at the member’s location; c) confirm the member’s actual physical location and reason for participating through teleconferencing. The minutes of the meeting shall record the bridge number established, when established and any other pertinent information thereto, the identity of the members participating via telecommunication, their location during the meeting and their reason for invoking the use of this method of participation in the meeting. (6) That teleconferencing shall be made available to a Parish Council member only under the following circumstances: a) That each Parish Council member shall have previously signed and submitted to the Parish Council Secretary, a written statement certifying that such member will, at all times, preserve the confidentiality of communications made during the meeting; b) will not allow any other persons to be present at their teleconferencing location or to be in such proximity as to be able to hear or see any of the communications that transpire during the meeting; c) will not record nor allow the recording of any communications that transpire during the meeting; d) that it is understood that teleconferencing is not a substitute for the obligation of each Parish Council member to attend meetings in person; e) that each eligible Parish Council member shall not use teleconferencing more than twice per calendar year. (1) A quorum of the Parish Council must be present at the Council meetings or the meeting may not be called to order and any and all Parish business discussed, reported, or proposed will be considered null and void. (2) A member participating in a Parish Council meeting via teleconferencing, shall be deemed to be “present at the meeting” if that member establishes their presence via telecommunication at or prior to the call to order of the meeting. (3) A quorum required for a meeting of the Parish Council shall be 60% of the total number of seats on the Parish Council, (rounded up to the next whole number, if a fraction). Nine members shall constitute a quorum for a Parish Council consisting of 15 members. A. Donations: The Parish shall use all special bequests, gifts, and devices only for the purpose for which they were made. B. Expenditures: The Parish Council is charged to keep expenditures within the limits of the budget as approved by the Parish Assembly. Any proposed single expenditure not budgeted for, exceeding the lesser of 10% of the overall budget or $8,000 must have the prior approval of the Parish Assembly. In addition in no case will the Parish Council permit the total expenditures in any one year to exceed the overall budget by 15% for that year without prior Parish Assembly approval. A minimum of three (3) bids will be required for any repairs, improvements, or construction involving any expense of five thousand ($5,000) dollars or more as outlined by the specifications. The Parish Council will require a written final Financial Report not later than 30 days after the event from any person authorized to spend Church Funds or in charge of Fund Raising events or any event involving finances. Monies spent must be substantiated with itemized bills and/or cash register receipts. B. With the exception of the committees specified in Section 11, Paragraph C, or where otherwise mandated by the Uniform Parish Regulations or bylaws, the President will appoint the chair of each Standing Committee, and may remove a chair. Appointment and removal both require approval, by a majority vote of the Executive Committee. b. In the event of a vacancy in the chair for either the Strategic Planning or Capital Fundraising Committee, a new chair (or co-chair’s) will be nominated by the President and must be approved by a majority of the Parish Council. E. The chair(s) of each committee will appoint its members. The president and Priest are entitled to appoint one member each to a committee. If the size of a committee is below that which is recommended in the Appendix, then the Executive Committee may appoint a sufficient number of members to meet the size recommendations with a simple majority vote. F. If a Committee chair is vacant for more than two months, the vacancy may be filled by a nomination from any Parish Council member and majority vote of the Parish Council. a. A member in good standing of the Parish for the current year, as defined in these bylaws. b. A spouse, son or daughter of a member in good standing, See G(a). H. The Parish Council President is entitled to serve as an ex-officio member of all committees. He/she may designate the Vice President to substitute for him/her in that capacity. I. The Parish Priest is entitled to serve as an ex-officio member of all committees. J. Committee chairmen may designate sub-committees to focus on specific areas (e.g. Hall Rentals within the Facilities Committee) with the approval of the Parish Council. The sub-committee will cease to exist upon the appointment of a new committee chair. K. The specific responsibilities of each committee will be approved and updated as needed by a majority vote of the Parish Council. It will be attached as an Appendix to the by-laws. A. The Parish Council after ratification of the elections and the affirmation of office have taken place and under the chairmanship of the Priest shall elect a president, a vice president, a treasurer, a secretary, an assistant secretary and an assistant treasurer. B. They shall hold offices for one (1) year, and/or until their successors are elected. C. The offices of the President or Treasurer shall not be held by the same person for more than six (6) consecutive years, except by special permission of the Archbishop. D. The elected council officers and the Priest (ex-officio) shall be members of the Executive Committee. Past presidents may be elected by the Council to serve on the Executive Committee (ex-officio) for a period of one (1) year. All past Presidents are invited to attend the Executive Committee meetings. The committee is accountable to the Parish Council. It shall be the duty of this committee to prepare the agenda for Council Meetings, and coordinate and execute council decisions. The Agenda, including what new business is to be discussed, should be sent to Council Members one week prior to a meeting. Special duties of officers should be indicated. Officers shall perform the usual and ordinary duties appertaining to their respective offices. The Committee shall hold one regular monthly meeting on a date to be determined by the Committee Members at their first meeting of the calendar year. Any member of the committee on twenty-four (24) hours notice may call a special meeting. The President shall be the representative of the Parish Council at all times and places. He/She shall preside at all special meetings of the Parish Council, shall be subject to the authority of the Parish Council, shall enforce all resolutions, decisions and regulations of the Parish, and with the Treasurer shall sign all checks for disbursement of monies as the Parish Council may by resolution provide. The President shall be empowered to establish Ad-Hoc committees, as he/she deems necessary and to appoint or replace Chairmen for said committees with the approval of the Executive Committee. Ad-Hoc committees will remain in place until dissolved by the President, not to exceed the end of the President’s term. In the absence of the President, the Vice President shall perform all the duties of the President (including signing of the checks), he/she shall supervise secretarial details, approve invoices and ensure expenditures were approved by Parish Council per minutes, initial invoices and turn over to the treasurer for payments, and shall perform such other duties as may be imposed upon him/her by the Parish Council at any general or special meeting. The Treasurer shall receive all monies payable to the Parish and shall deposit same in the name of the Parish. He/She shall pay all expenditures approved by the Vice President (Article IV, Section 5, Article 4), make any necessary withdrawals, issue receipts for monies received, reconcile bank statements. He shall present a detailed statement of the financial condition of the Parish at each monthly meeting of the Council. He shall present a detailed report of such financial statement for the preceding fiscal year at the annual meeting and forward copies to the Archdiocese Auditors elected by the Parish Assembly shall audit this report. He shall sign all checks, which will be countersigned by the President and/or Vice President. The Secretary shall keep accurate minutes, records, documents, and papers of the Parish in such place as shall be designated by the Council and such records shall at all times be available to the Parish Council and members in good standing. He shall be present at all meetings and shall record all resolutions and proceedings of said meetings. He/She shall give notice of all meeting dates of the Parish Council and/or General Assembly. He/She shall attest all papers, contracts, and correspondence of the Parish. The Assistant Secretary shall assist the Secretary with mailings and take minutes in the absence of the Secretary. The Assistant Treasurer shall maintain journals and ledgers, issue receipts in the absence of the Treasurer, make deposits and generally assist the Treasurer as needed. The Executive Committee shall approve the appointment and removal of chairs by the President as specified in Article 3, Section 11. Operations shall follow the process outlined in the Uniform Parish Regulations. shall submit its report of such audit to the Parish Assembly by the first meeting following the calendar year being audited. Their duties are limited to the examination of the records, receipts and payments, verification of proper recordings in the books of the Church and whether generally accepted accounting principles have been applied. Amendments, revisions or rescissions of these Bylaws shall be approved by the Parish Assembly at a regular or special meeting called for such purpose as per Article 2, Section 1 and 2 of these By-Laws. Changes will take effect only after approval by the Archdiocese. Terms used but not defined herein shall have the meanings ascribed them in the UPR. In the event these bylaws conflict with the UPR, the UPR shall govern. Paragraph B - Date of Election for Parish Council. Sec. 1, Paragraph A, B - Parish Council - Number of members and length of Term. Sec. 2, Paragraph A - Nominations of Council Members. Paragraph A - Individual Membership.